The industrial revolution was still a way off. Britain was still predominantly rural like the continent. But agricultural output was "at least twice that of any other European country, and was to continue so until the 1850s." note8 World trade was rising but just a small fraction what it would be a century later, and Britain was benefitting from exporting more grain than it was importing. Its agriculture benefited development in general. Productivity and real wages were inching upwards. People's lives were improving materially. They were getting more in return for their labor. People could buy manufactured items. John Locke (above) and Thomas Jefferson. Locke died in 1704, but his influence lived on through the century. 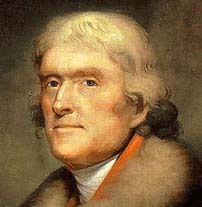 His views on liberty and politics influenced Alexander Hamilton, James Madison, Thomas Jefferson and others in the colonies. Jefferson was to write: "Bacon, Locke and Newton ... I consider them as the three greatest men that have ever lived, without any exception." (The Letters of Thomas Jefferson: 1743-1826 Bacon, Locke, and Newton). France had more than three times England's population, but Britain led in world commerce, ahead also of the Dutch Republic, which was economically progressive but had a fraction of Britain's population. With the rise in Britain's commerce, London had become a busier place and had been gathering more people from England's rural areas and from Scotland, Wales and Ireland. London also had migrants from Germany, Holland and France. London had become a great center for the arts and fashion. A new interest in variety and consumerism had developed. The idea that it was okay to find delight in buying things was taking hold. Christian asceticism was in decline. The Puritanism of Cromwell's time was fading, and so too was adherence to Biblical admonitions regarding the accumulation or lending of money. English men and women had begun wearing lighter and brighter clothing instead of heavy wool and linen. Meanwhile, wrist watches were still inaccurate curiosities, and people kept time by the ringing of church bells. With the new hustle and bustle of English life, people were accepting a higher taxation from which came appreciated services that were a part of that hustle-bustle. These were times of increased literacy. Europe's Enlightenment had reached maturity. Personal correspondence and other forms of writing were on the rise. Literate people gathered in groups interested in science or literature. A variety of learned journals were published. Book production had increased, and so too had newspaper distribution. In Scotland in 1700 around 45 percent the population could read, and by the end of the 1700s it would rise to 85 percent. England's literacy rate in this same period is described as having risen from 45 to 63 percent. These were times when fanaticism was more feared and intellect more respected. Restraint in the expression of passion had become more of a mark of a gentleman, and good manners had become more valued as a barrier against conflict. Britain's middle-class debated religion and politics in coffeehouses, clubs, salons and literary societies. 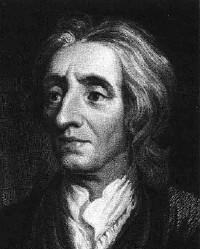 Most intellectuals favored the existing constitutional monarchy as had Locke. But England still had its republicans and people dissatisfied with the liberal revolution of 1688 – the so-called Glorious Revolution. As had happened in the Dutch Republic, shifting religious beliefs and rising commerce was accompanied by a decline in demand for religious uniformity – a step away from the belief that those with views different from their own were evil. With Copernicus, Galileo and Newton a new optimism about the benefits of learning had arisen – in conflict with the old and common belief that the world was a mystery never to be fathomed by humanity. Many, including people who believed in science, continued to believe in God's interventions, but the belief that the world functioned solely by God's magic was in decline, as was the belief that all humanity needed to get by was spontaneity and proper religious attitude. A leader in world trade, Britain had become the world's leading naval and colonial power. And some were proud of it. England's tradesman, pamphleteer and author of Robinson Crusoe, Daniel Defoe, spoke of his homeland as "the most diligent nation in the world." Power domestically was still dominated by the wealthy landowners, the aristocrats. Most men were unqualified to vote because of a land qualification law. A few owned much of the country's agricultural land. Some others owned small farms. People rented land from the big landowners, giving the landowner a share of the wealth they produced. And many others labored for wages on the landowner's property and were able to graze a pig or a cow on the village common. Parliament was divided between the party of the landed aristocracy, the Tories, and the Whigs, middle class liberals. As a constitutional monarch the king's powers remained. John Locke's argument prevailed. There was doubt concerning the absolute wisdom of monarchical governments claiming to be the agents of God, while the Tories were quick to associate their values with those of God and the Anglican church. The Church of England was favored by England's landowning elite, and parliament's House of Lords was an Anglican preserve. The Tory party was also called the 'Church' party. Religious pluralism had been legalized, but the Blasphemy Act of 1698 had made denial of the Trinity punishable by imprisonment. Denying that Christianity was the truth or denying the authority of the Scriptures was also illegal. But these laws were rarely invoked. In England, the last execution for heresy had been in the early 1600s, and the last to have been executed in Scotland for heresy was a nineteen year-old student at Edinburgh in 1698. From 1710 to 1714, conservatives tried to revive the union between the state and the Church of England. They feared that if people were left free to choose their religion there would be a dramatic spread of Dissenters. Also they thought that religious disunity was an affront to God, that it threatened the salvation of individuals and national security. Some Anglican conservatives also blamed crime and vice on religious disunity. The conservatives failed to pass their legislation, but to the surprise of the conservatives the number of Dissenters (those other than Anglican) remained stagnant. The Church of England remained dominant in rural England, in the universities and in grammar schools, while the Dissenters remained strongest in the cities and the middle class. And from the Anglicans a small new denomination emerged. Two Anglicans at Oxford University, John Wesley and George Whitefield, started a movement dedicated to nurturing spirituality through prayers, devotional readings, self-examination, fasting, frequent communion and good works, which won them the nickname of Methodist. Catholics remained a persecuted minority, largely clustered in remote parts of the country, as Protestants remained fearful of plots to bring Catholicism back via England's enemies abroad – Spain or France. Protestant "dissenters" continued to be able to run for a seat in parliament, but their representation there was small, and Dissenters did not enjoy legal equality with the Anglicans. A law passed in 1753 held that only marriages performed by an Anglican clergyman were legal. Dissenters might be denied the right of burial in a churchyard, they might receive discriminatory consideration in a court of law, and Dissenters had to pay a special tax. Crime was increasing with the advancing economy. In London were habitual offenders and gangs of delinquent youths. Responding to crime, politicians made more offenses punishable by death. Capital crimes numbered in the dozens, including horse and sheep stealing and shoplifting to the value of five shillings. But rather than being hanged, many deemed guilty of a capital crime were sent to the Americas. English law was a gathering of complexities and contradictions void of elegant simplicity. The influence of Roman law on English law remained a rumor. Roman law was used only occasionally as a mere ornament for jurists. Law in England was drawn from English experience, and it was criticized for its anomalies, complexity, uncertainties, its slowness, its tedious forms and its confounding of simple matters into confusing language that helped enrich lawyers at the expense of honest people. William Blackstone (1723-80). Americans who first learned law by reading Blackstone include Alexander Hamilton and Abraham Lincoln. 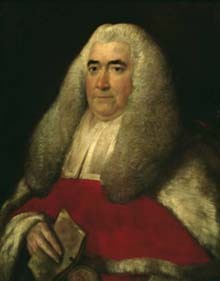 In the mid-1700s, a lawyer named William Blackstone made a name for himself writing about English law. He tried to put law into conformity with science and the age of reason. Blackstone mapped the law's tortuous complexities and depicted the nation's constitution and laws as a reflection of the natural order of the cosmos and the nation's development across history. British law and liberty he wrote was the "noblest inheritance of mankind." Blackstone approved of law which held that a husband and wife were one person and that the husband was that person. In other words, Blackstone approved of law that held that a wife had no right to own property in her own name and that the wages she earned belonged to her husband. Blackstone claimed that the power of parliament was absolute. Elsewhere in his work he claimed that the legislature could not destroy human rights. He advanced the use of such phrases as crimes and misdemeanors, ex-post facto law, due process and judicial power. Blackstone denounced slavery as inimical to "natural rights" and to British law. He advanced the idea that the instant any slave landed in England he or she should be ruled as free. Acting on general principles of "God-given right," English law, he claimed, protected "a Jew, a Turk or a heathen as well as to those who press the true religion of Christ." He described freedom of the press as "essential to the nature of a free state." And trial by jury he called the "glory of the English law." In England the idea was widespread that common people had rights. It was an idea too among people in England's American colonies. The Philosophical Works of David Hume, editor. T. H. Green and T. H. Groseeen and Co., 1882. "The Forces of Nature: the Road to Revolution," Chapter One in The History of Britain, Volume III, by Simon Schama.